Rules that you’ve broken: My mom always told me not to whistle, not to play with my hair, to wash my face before I sleep.. but I don’t do any of those things. Best pick-up line ever: Girl are you from Tennessee, ‘cause you’re the only ‘ten I see’! Most embarrassing moment: It was quite recently when I went on a coffee date with someone and it was the first time I was meeting them. I also happened to be testing out my new car. And I kept trying to parallel park over and over again. And the person texted me saying, I am having a lot of fun watching you park! That was embarrassing. Your autobiography would be called: A journey of one girl’s life to obtain skittles. Superman in your life: Actually, I don’t care, because I’m too busy being superwoman! But honestly, superman to me is my grandpa – best hugger, best smile and he always makes me feel really good. One-liner that always cracks you up: Why was piglet looking in the toilet? ‘Cause he was searching for Poo-h! On your Whatsapp: Last person I texted was Connor Franta! Favourite emoji: Obviously, the unicorn emoji! Catch Lilly Singh a.k.a. 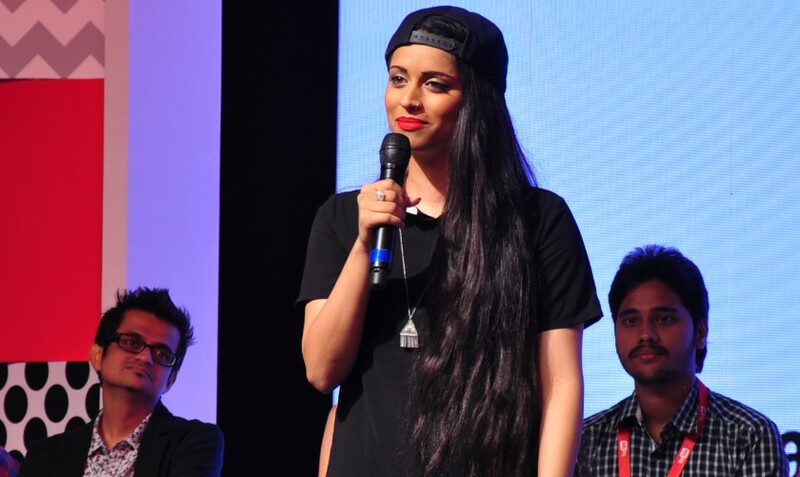 Superwoman at the Youtube FanFest on March 18th, 2016 at the NSCI stadium in Mumbai.